He doesn’t stop here. Saying you’d pay for something isn’t good enough for him. Noah is one of the best marketers/growth people in the world. He was the original marketer at Mint, and grew AppSumo (his own business) to eight figures. I’ve been friends with Noah for several years now, and have gotten an inside look at several of the things he’s done. He’s helped me with Bidsketch and taught me one of the most valuable things I’ve learned about marketing (and how he achieves such crazy growth). How is Noah’s process different? Noah: Ok, but how do we make it into a no-brainer for you? Next, he’ll make some other suggestions to improve the product, or dig deeper to find out why it’s not a no-brainer for me. “Yes, I would pay.” Isn’t good enough. There needs to be noticeable excitement and money thrown at him. Some people might say, “Yeah, I know, it needs to be a must have product.” But most people have a low bar when comes to must have. Noah’s bar is easy: it must be a no-brainer. It has to be so valuable, that you would have to be dumb to pass it up. I’ve seen him do this over and over. He puts in a ton of work (past the “I’ll pay for it” stage) to come up with something that’s a no-brainer. If you pay attention, you’ll see this in everything Noah does. The whole concept of AppSumo is about this no-brainer idea. Amazing web tools at ridiculous prices. You’d have to be dumb to pass these deals up. 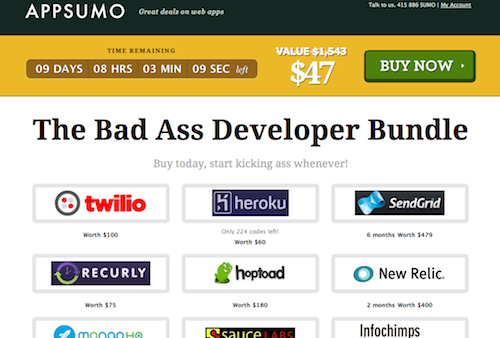 $1,500 worth of apps for $47 is an insane discount. And for the right audience, it’s irresistible. Over the years they’ve experimented and changed the way they do deals, but it always follows this rule. If you were doing a contest with Dropbox as the prize, what would your contest look like? It would probably be for one year of Dropbox (worth $99). Maybe throw in a few other tools and prizes. What does he Noah do? He gives it away for life. Not one or two years. 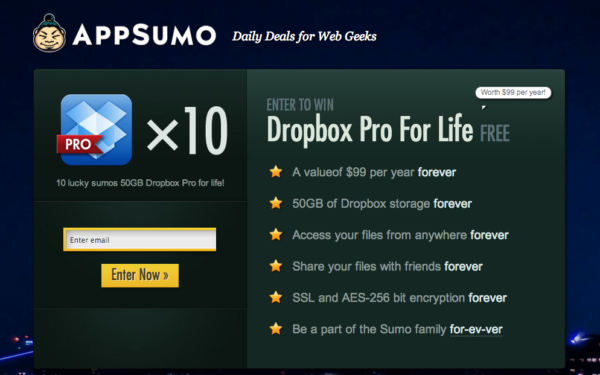 If you win, you’ll never have to pay for Dropbox again. Is there one winner? Nope, ten people win Dropbox for life. Making it a no-brainer is everywhere you look when you’re checking out what Noah is doing. Noah recently launched a podcast and you can see this concept at work in the way that he’s promoting it. 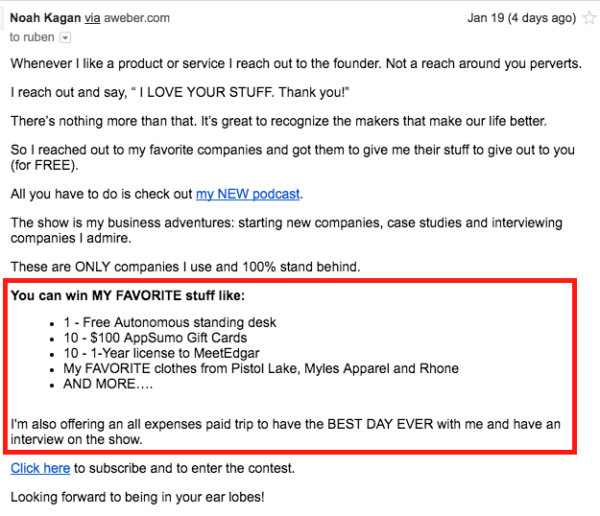 He gave away an all expenses paid trip (to have the BEST DAY EVER, heh), a standing desk, and a ton of fun stuff. Result? Over 600 comments, 400+ iTunes reviews, and loads of shares. Want to hear Noah talk someone through this no-brainer process? In the podcast, there’s a case study episode with his friend Dustin Lien. Towards the end of the episode Noah shows exactly how he thinks about the no-brainer stage. You should check it out (it’s the case study episode 001). Once the no-brainer concept clicked for me, it changed the way I think about marketing. There are too many founders trying to force a product into a market. They’re selling something without enough demand. I’ve heard people say that if you can find one customer, there are ten more out there. And if you can find ten, there are a hundred more. It might feel good to hear this when you’re struggling, but the truth is, this kind of thinking can be trouble. It can lead to wasting years on a product that’s not delivering enough value for real growth. This bar is too low. We can do better. Like Noah, we shouldn’t be satisfied until we have something that delivers so much value, that it’s a no-brainer. Nice write-up. I appreciate you writing this. It makes me realize the power of branding, authoring, and repetition. That being said, this wp-theme doesn’t do enough to brand (you?). Even better than asking if an item is a no-brainer is to ask for the sale right then. If it’s really a no-brainer, it should be an easy conversation.